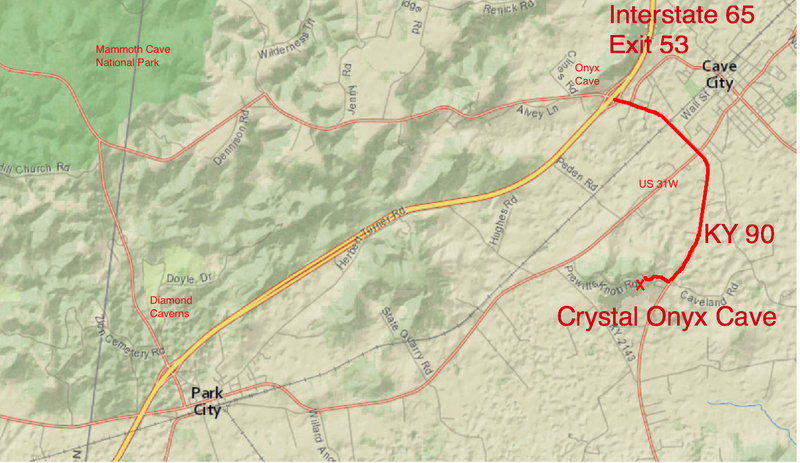 Crystal Onyx Cave – We're not mammoth, but we are spectacular! View of the first landing showing The alligator's mouth, the guardian angel and, way off in the mist, the pelican on the scenic trail. 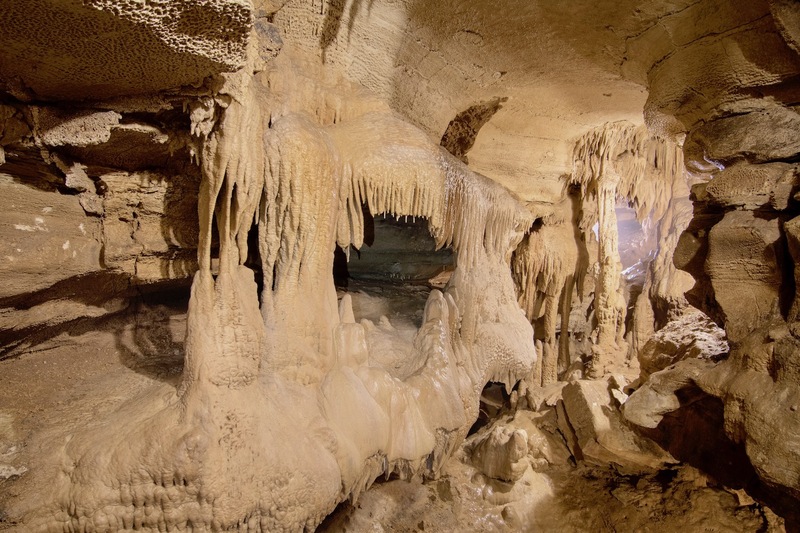 CRYSTAL ONYX Cave is one of the most beautiful caves in the USA. The lighting is exceptional and designed to show our beautiful formations. 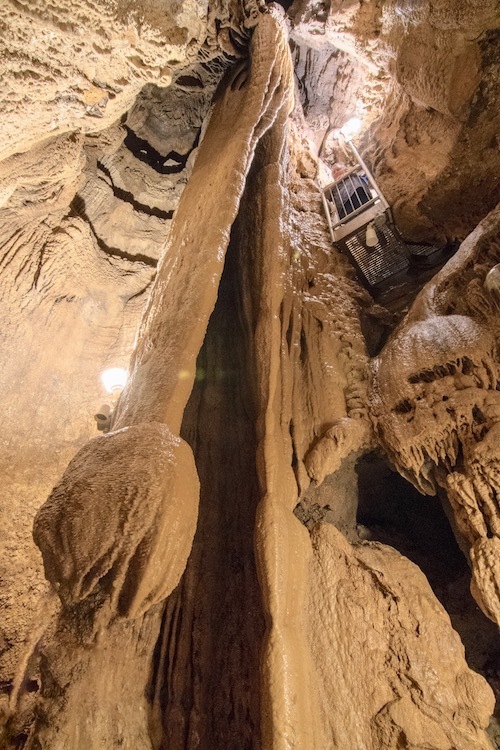 The cave was discovered by prehistoric people about 680 BCE. Rediscovered by modern man in 1960. Come visit us for a one hour tour. We are under the cell phone towers on Prewitts Knob. We also have a gift and mineral shop stocked with neat stuff. Open 10 am to 7 pm Central time. Open everyday now through Oct. 31, 10 am to 7 pm central time. No reservations needed. One hour tours on approx. 35 minute departures. Prices: Adults $15, Children 4 to12 – $13. Credit cards OK. The lowest price one hour formation filled cave tour around. One of our reviews: Beautiful Close-up Experience! We are under the cell towers atop historic Prewitts Knob. From I-65 take exit 53. Head southeast on KY-90. Go straight at the lights. DO NOT follow your GPS or AppleMap onto US 31-W. Follow KY 90 two miles to Prewitts Knob Road. Turn right at our sign and go up hill 1/4 mile. 425 Prewitts Knob Road, Cave City, KY 42127. Professional photos courtesy of Matt McClintock.